Well so much as happened on it. Engine built to low compression as mentioned before and this is all good. At the same time we sorted out the issue with the crankcase breather, and we have fitted an intercooler for the reasons mentioned before. 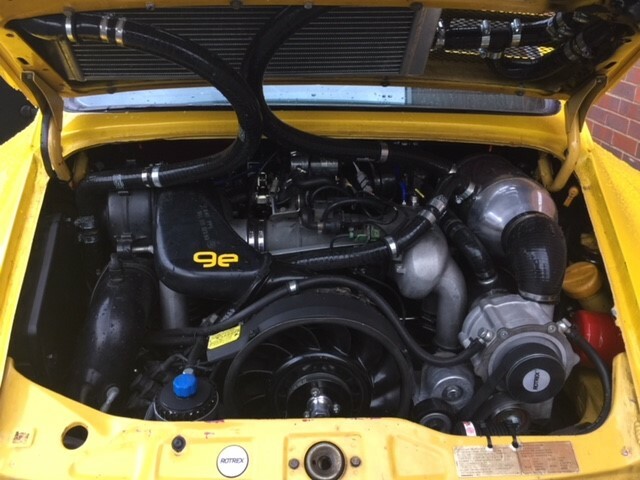 You can see in the pictures that we now have an intercooler fitted on the inside right of the engine bay which is feed by cold water. Lots of pipe work etc. The concept of running it from the front was just not really feasible. Then despite the fact that the brakes were upgraded in the normal fashion, i felt more time could be had with proper race brakes, so we have a custom set of brakes made for us - 8 pots on the front and 6 pots on the rear with 356mm - these brake are simply amazing - almost went through the windscreen first time but the pedal is very progressive and the brake bias is perfect. As you will probably notice, we have a new set of wheels as well. 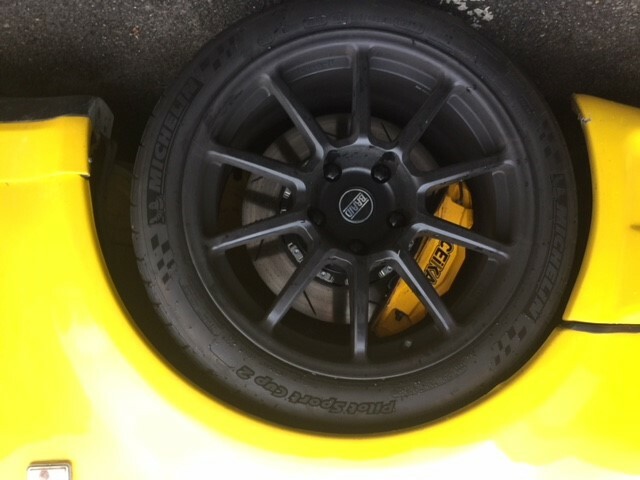 The original wheels turned out to be for race use only and we cracked one (which prevent a Spa trip - we took the opportunity to increase the footprint to 295 on the rear and 245 on the front. Together with our set up on the car running around 3.5d it is like a gokart on track. So, about a month ago, we tried to tune the engine on the stock dme and frankly that dme is so out of date, which we could get the car running, it just wasn't running well. Since we now do MoTeC installation and tuning, we installed a couple of additional sensors in the car and installed latest MoTeC dme and the tuning went like a dream. We were unable to run a lot of timing in since one of the knock sensors was showing a little knock (subsequently turned out to be a fault sensor) - benefit of modern DME to be able to see everything. With only a few hundred miles on the engine and with not too much timing in the tune, and all of the above, we decided to drive the car to Zandvoort for a couple of days testing and do some live tuning in Europe on the way. Everything was going great on the way over until the dowel on the supercharger pulley (which effectively is the drive pulley) snapped leaving me stranded in Belgium in the middle of nowhere so never got to do some testing on it last month. Car is back with me, we have fixed the dowel issue, replaced the knock sensor and this Friday we are planning on doing some more tuning on the road. Whilst driving and tuning in Europe before it broke down, we learnt that the IDC was around 82% on full boost which is with 993 Turbo injectors and pump - this suggested that since we know that is the same as a stock 993 Turbo runs on injector duty, that the car was around 400ps. In fact on a number of tests against a 991gt3rs in a straight line, there was not much in it between the two cars. Furthermore last week I managed to get an initial dyno plot of 328whp, despite the car not having a lot of timing up top. I am going to try and get a UK track day before Xmas in for some testing. The IATs are great with the intercooler set up, no issues with crankcase breathing now etc. I was disappointed not to have got to Zandvoort as two days of solid testing on track would have proven the point in terms of the all the issues we have faced. That said, projects like these, which for me, is a personal challenge to get right, are not easy. On the road, it is so much fun, especially in the wet conditions we have been having. So balanced, and the power is very linear in delivery. Once I get the final tune done I'll update with final power output. However we do have the option to fit a smaller pulley to increase boost now, the MoTeC will take care of it automatically assuming we have enough fuel. Just to add, it might seem like this project has been going on for sometime, which it does, but we get very little downtime to get on with this, and fabricating the intercooler solution is not a 5 minute job, as is building the engine etc. Very nice. I'd love to do something like this with a mega miles 964 or 993. How many aircooled engines do you do every month? I had a chat with your engine builder and he mentioned you can go to 4.0 with air cooled now? I'd love an Ed Pink Singer type 4.0 build. Is this possible and what would the cost typically be? The percentage of air to water cooled is pretty even at the moment. Previously we did one engine a month, but with the larger engine room we can do two a month. Anything is possible and price, well it depends on both piston/liners and amount of machining needed. At the moment we are doing a 3.5L build from a 3L carrera crankcase, using a 3.2 Crankshaft with 74.4mm stroke and 100mm pistons giving exactly 3500cc. But don't forget you need all the other stuff. I don't like on the air cooled the lack diagnosis etc many have zero knock control - it amazes me the number of builds I see without even knock sensing or lambda sensors - tuning one of these on a dyno is generally fine, but then you are not tuning for different loads at different gradients for example which is why a lot of these cars pop and bang going up or down hill. At the moment our best advice it is fit the latest generation of MoTeC, have all the other sensors installed and give yourself the best protection for the engine - that is not cheap, around £7k on its own with the system, tuning, fabrication to fit sensors etc, but another engine I am building at the moment is close to £30k, so imo it is crazy not to have the best engine management available. It allows us to put the car into limp mode based on all the sensors like fuel pressure, oil pressure and so on. Starting with a 964 engine does make things easier compared to pre 89 engines. And yes you can do 4L etc. It really just depends on your budget. We partnered with Protomotive when we created 9e - Todd K has over 30 years of building experience and was building 4L Porsche engines before Porsche did - in those days you had to create your own crankshaft etc. We are fortunate that together with their experience and our own through the turbo side, that we have a wealth of engine building experience. 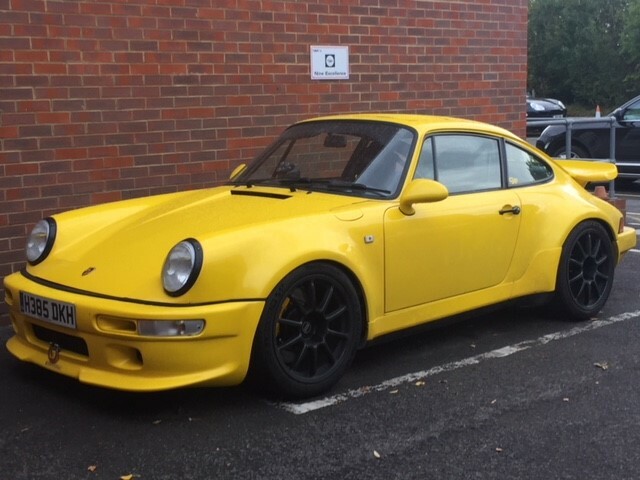 Even on a stock 964 rebuild we never rebuild completely stock - we always upgrade components that we know are weak, hence why we offer a fully comprehensive warranty in house. Yes sorry there has not been much updates - we try to fit that around every day work so it is always at the back of a long queue for us to spend time on. As to whether it is commercially viable, to be honest, we didn't do it for that, it was just a fun project since most supercharged projects don't seem to run smoothly, or engines fail etc. Changing from NA to Boosted is difficult - the engine is not designed that way with compression and intake etc. If we get multiple days on track without any issues, then we may look to do a simple project for customers. Singer with Williams and Hans Mezger now doing a new 500bhp air-cooled engine which I think may end in tears. I don't believe its possible personally but hope they succeed. Will have some hp numbers from a build soon - stroker 993 with 80.4mm billet crank with 102 p/c for a nice 4L. Will be running a 996 gt3 intake manifold with gt2 evo cams for a great super wide power band. Looking forward to seeing the numbers on that. The singer stuff is top of the range - when you have a budget like that you can cnc everything to perfection in design etc. But an engine is an engine at the end of the day.